It’s safe to say that Bikram Yoga’s founder, Bikram Choudhury, was ahead of the curve. Born in Calcutta in 1946, he began practicing yoga at four years old with India’s most celebrated physical culturist, Bishnu Ghosh. Bikram is the founder of the yoga movement in Hollywood as well as the founder of the worldwide Yoga College of India. Bikram’s mentor Ghosh was the younger brother of Paramahansa Yogananda, author of the popular book, The Autobiography of a Yogi, and a founder of the Self-Realization Fellowship in Los Angeles. Ghosh was among the first modern gurus to document scientifically how yoga could cure chronic physical ailments and heal the body from the inside out. Bikram devoted four to six hours daily to the practice of yoga, and at age 13 was the youngest contestant to win the National India Yoga Contest. He remained undefeated for three years until he retired as the undisputed “All-India National Champion.” Indeed, Swami Shivananda declared him “Yogi Raj” (King of the Yogis). Bikram went on to pursue an athletic career as a marathon runner and a champion weightlifter. pronouncement that he “would never walk again,” he returned to Ghosh’s school. Six months later, his knee had recovered completely. Ghosh embraced Bikram’s enthusiasm for the discipline, inviting him to open several schools in Bombay and other parts of India. With immediate success, Ghosh sent his disciple to other places to open schools including Tokyo. There, Bikram combined western medical science with traditional eastern doctrine to perfect his 26-posture sequence. In a research project, Bikram helped physicians prove that yoga could regenerate tissue and cure chronic ailments. Celebrities were drawn to Bikram and, in 1973, he was invited by President Nixon and Shirley MacLaine to the United States. By 1974, he had founded the Yoga College of India in Beverly Hills. His famous students have included everyone from Raquel Welch, Michael Jackson and Quincy Jones to Barbra Streisand, George Clooney, Lady Gaga, David Beckham and Beyonce. Add numerous other celebs and athletes, all of whom helped spread the Bikram phenomenon. Today, Bikram has demonstrated to millions the light and benefits of a healthy life. Despite his controversial press, he has been the most revered Yoga Guru on the planet. 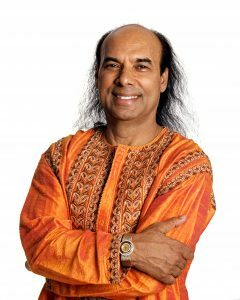 Having conducted workshops and seminars around the world and written books on Bikram Yoga, he is largely responsible for moving the practice into the mainstream. And while he concedes that yogis from other hatha traditions know the poses, he believes that the sequence of the poses makes his system different. His platform is that each posture in his series forms the perfect basis for the next, while warming and stretching the right muscles, ligaments and tendons. Much like creating a song — wherein combining notes in a melodic way distinguishes a great composer — his practice is one-of-a-kind. His whole family practices including wife Rajashree, a world champion yogini who specializes in yoga therapy for people with chronic diseases and disorders as well as her pregnancy yoga classes. And his children, daughter Laju and son Anurag, both practice advanced yoga postures. His concern lies with people who purport to do hatha yoga correctly, but do a great disservice because they don’t practice correctly. There can be no substitute for true hatha yoga. And, likewise, there is no substitute for daily practice under the guidance of a certified, qualified teacher.